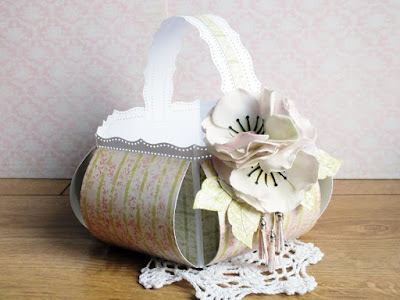 Once a month a member of the Scor-Pal design team looks for inspiration on our Pinterest board and recreates the project to make it her own. My inspiration this month is a Z Box Fold Card created by Lyndsey on The Craft Blog. This is her card. 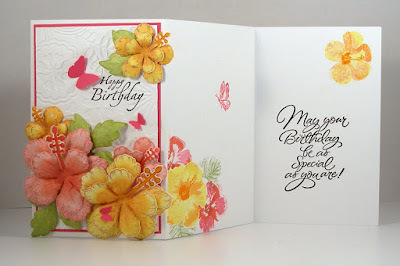 To make my card I used a brand-new stamp set from Kindred Stamps called Students of Magic. Kindred Stamps has a large selection of pop culture stamps, including a single stamp called Owl Post, which is perfect for decorating the accompanying envelope. I started my card by stamping and coloring the three young wizards in the stamp set. After they were colored, I cut them out. 1 piece 4 1/4" x 11"
2 pieces 2 1/8" x 11"
I scored the larger panel and one of the small panels at 2 3/4" and 5 1/2". 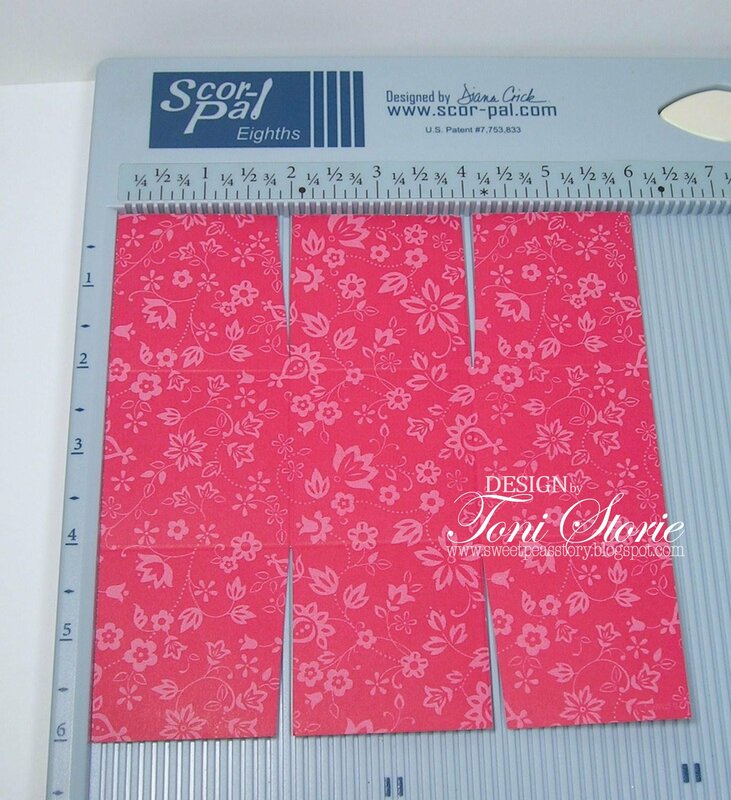 I then applied patterned paper (cut 1/4" smaller on both sides) to the various sections of each panel. 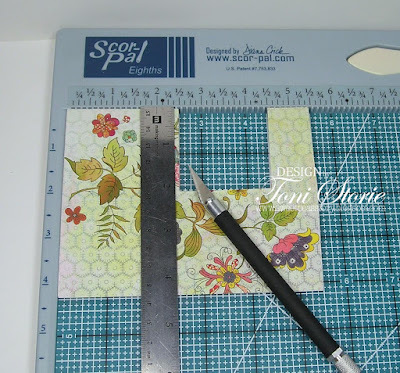 On the reverse side of the smaller panel I applied Scor-Tape at each end, as shown in the photo. I then adhered this smaller panel to the larger panel, slightly above the bottom edge. 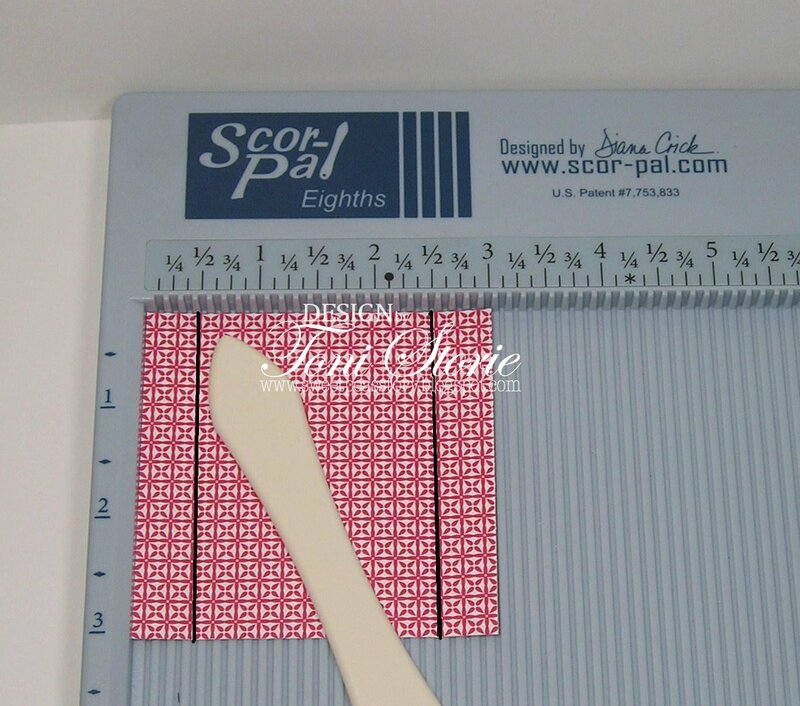 The other 2 1/8" x 11" strip of brown cardstock was scored as follows: 7/8”, 3 5/8”, 4 1/8”, 6 7/8”, 7 3/8” and 10 1/8”.. 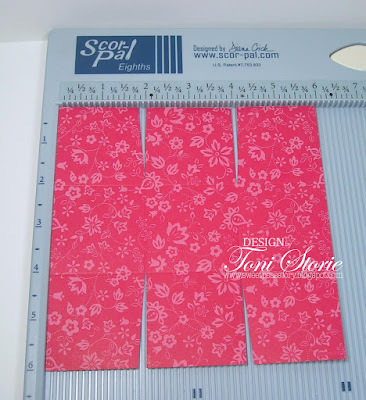 I adhered panels of patterned paper to the "front" panels of this inner strip . . .
. . . and inserted it into the box. 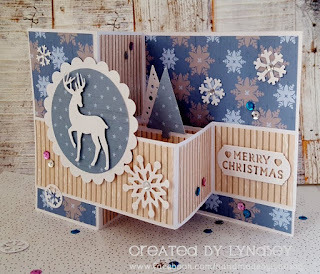 I then cut an inverted scalloped circle from the same brown cardstock and added Scor-Tape strategically in order to adhere it to the front of the card. I added a smaller circle of patterned paper and one of the wizards to the front of the circle and adhered the circle to the front of the card. You can't see it well, but I added some clear glue to his glasses. I cut two small strips of acetate, attached them to the other two wizards, and placed them "in the box." Using stamps from a Just Rite set, I made the train platform sign and attached it to the back wall. The original card had a sentiment on the small panel on the right, but I wanted to add something more appropriate to the scene. So I Googled some free clip art and found some luggage and a bird cage. The luggage I printed onto cream cardstock, and the birdcage I printed on a piece of acetate. I cut them out with scissors. Notice that I cut out two of the small brown suitcases. When I adhered them to my card, I added the second brown suitcase with foam dots to make a little 3-D effect. I stamped the owl from the stamp set, cut him out, and adhered him to the card above the suitcase. When I adhered the acetate birdcage over the owl so it looks like he's inside the cage, it was a little difficult to see the cage. So using a Faber Castell XS black pen, I went over the cage lines. This made the cage a bit more noticeable. I then stamped the "Owl Post" image to the lower left-hand corner of my envelope. And now my project was complete. Note that the card folds flat to fit inside a standard envelope. We are flying through the month! Here we are at the half-way point and I have the mid-month tutorial for the Scor-Pal "More Than Once Score" challenge. 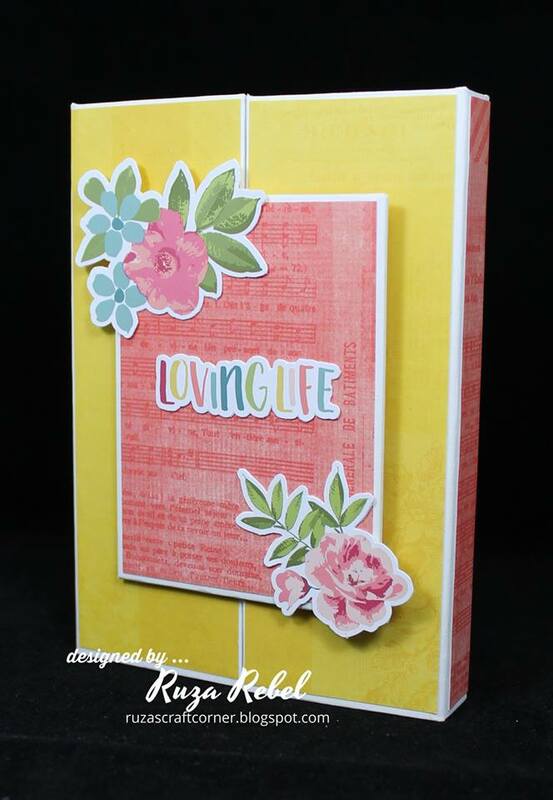 Our theme is All Things Bright and Beautiful, so I worked in some paper that I think is beautiful and the color red. The rest of the team made some amazing projects, so be sure to check them out on the Scor-Pal blog. 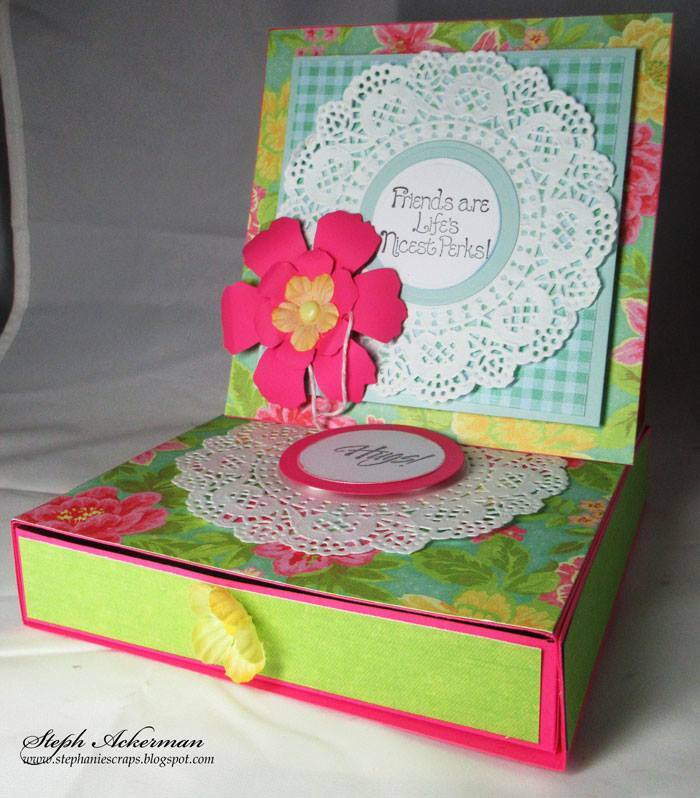 I'm hostessing this month and so I made this cute little gift box with a card-stand. 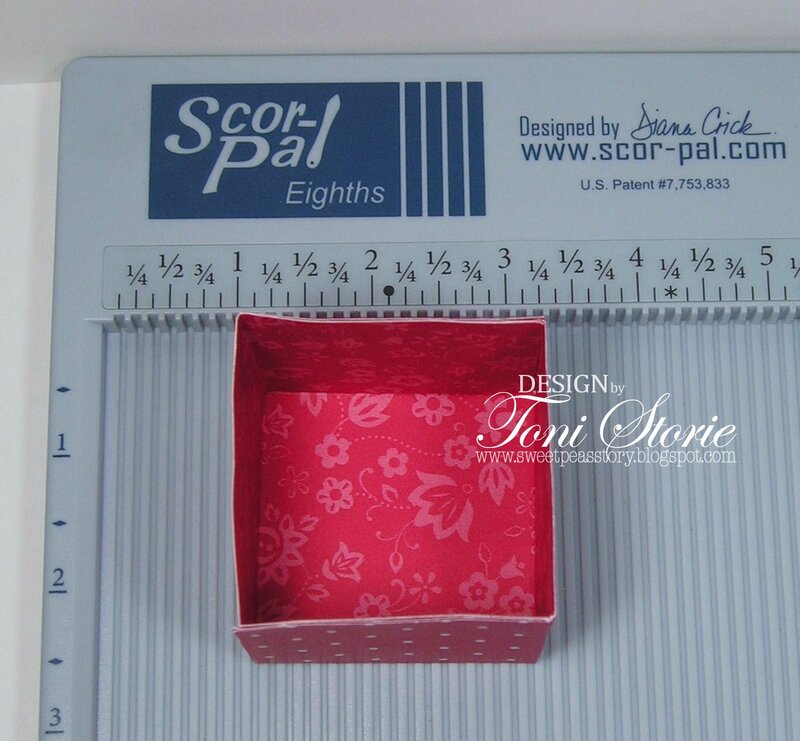 Place the 3"x 3" piece of paper (could be patterned paper) in the Scor-Pal. 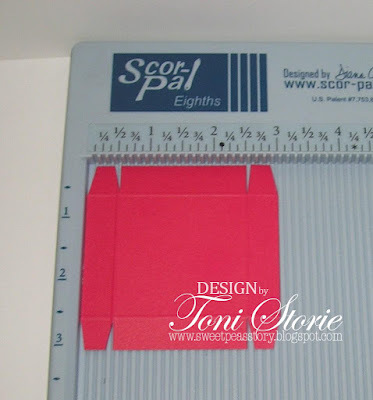 Score at 1/2" and 2 1/2". 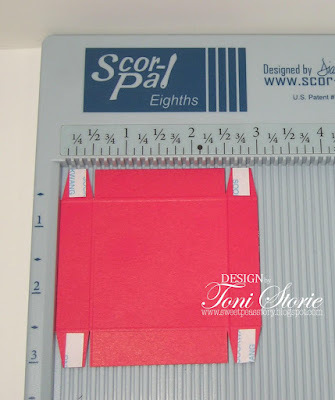 Rotate paper 90 degrees and score again at 1/2" and 2 1/2". 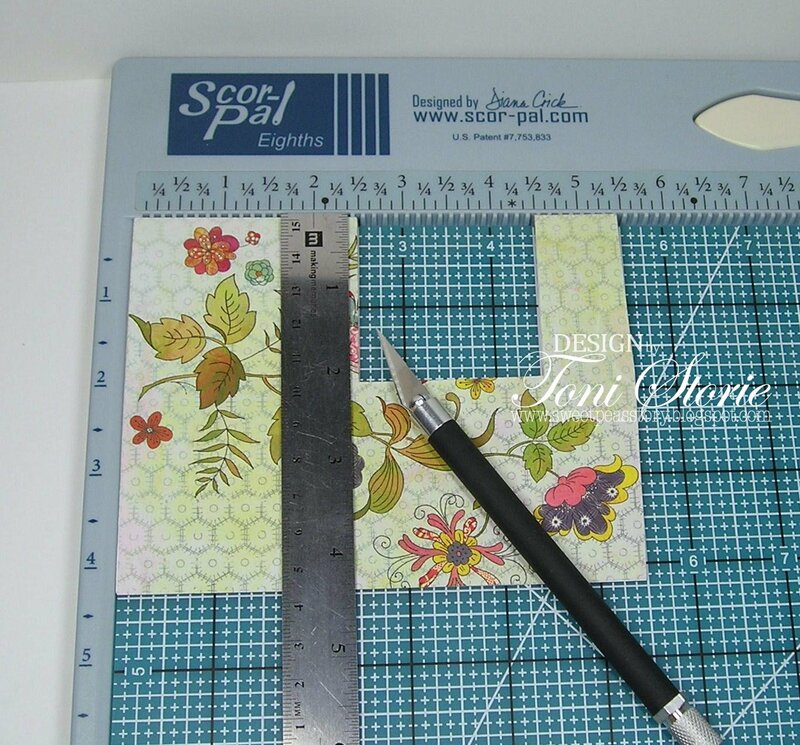 Quick tip: Place the pattern you would like to see face down in the Scor-Pal. Burnish the score lines. 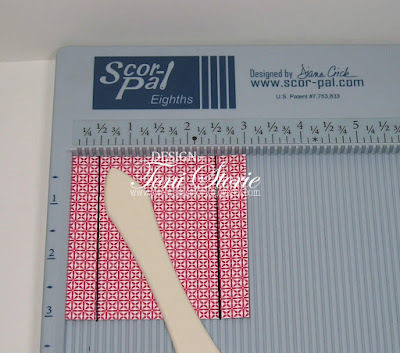 Trim on the score lines to 1/2" on opposite sides of the square. 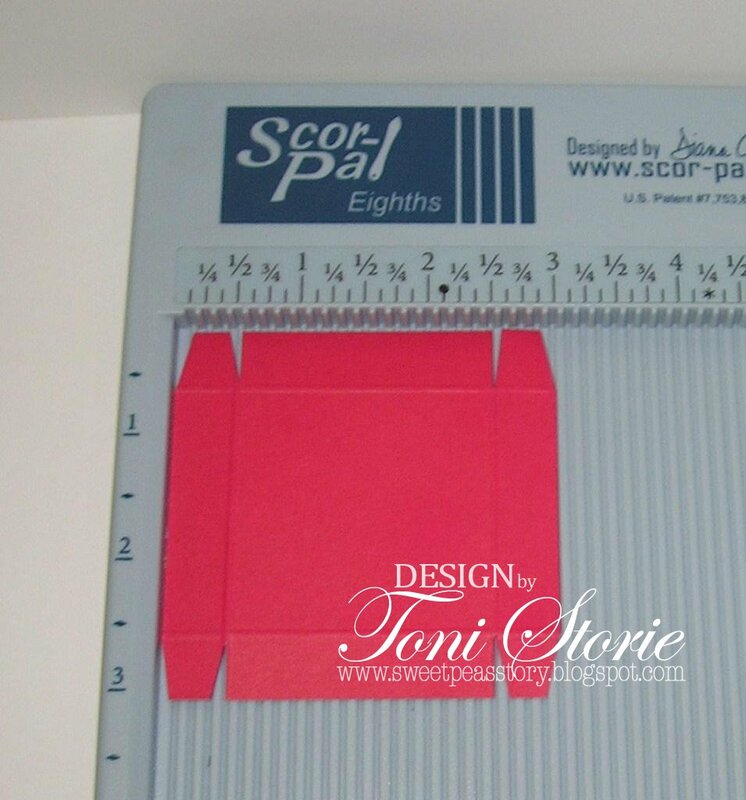 Adhere Scor-Tape to the newly created 1/2" tabs on opposite sides of the square. 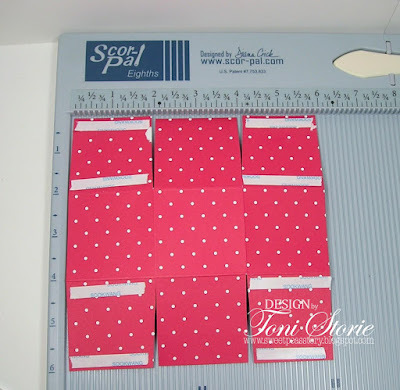 Remove adhesive backing from the tabs and fold in to create the gift box lid. 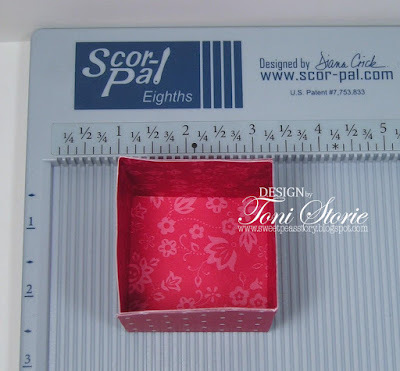 Place the 6"x 6" piece of paper (could be patterned paper) in the Scor-Pal. Score at 2" and 2". Rotate paper 90 degrees and score again at 2" and 2". Burnish the score lines. Trim on the score lines to 2" on opposite sides of the square. 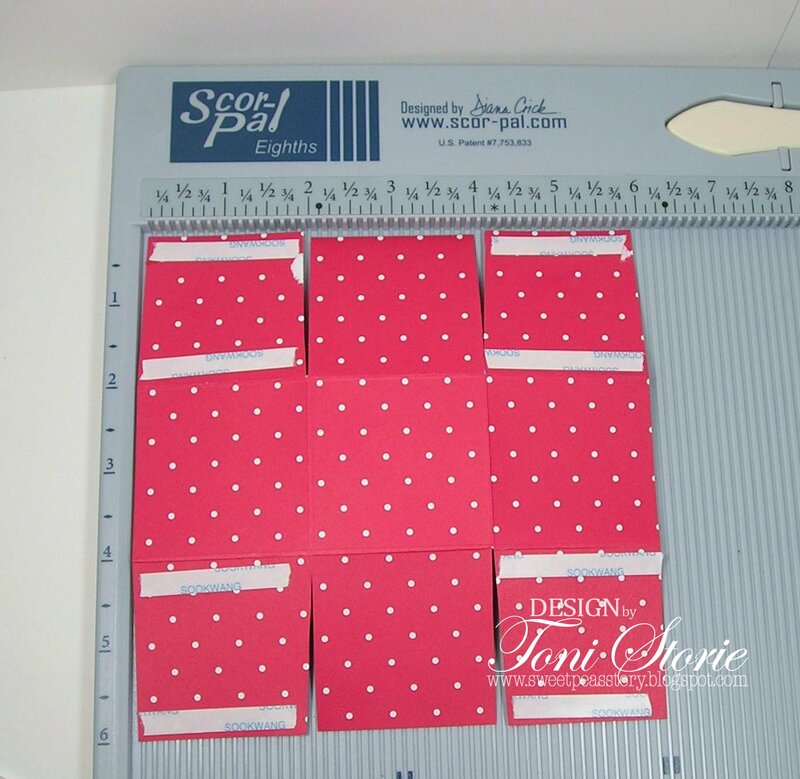 Adhere Scor-Tape to the newly created 2" tabs on opposite sides of the square. Remove adhesive backing from the tabs and fold in to create the gift box bottom. 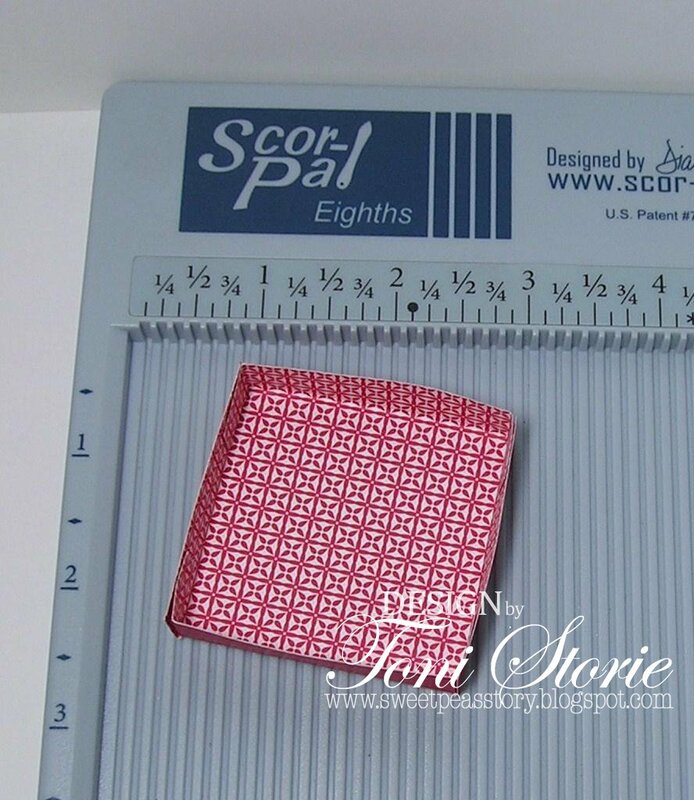 Place Scor-Mat into the Scor-Pal. 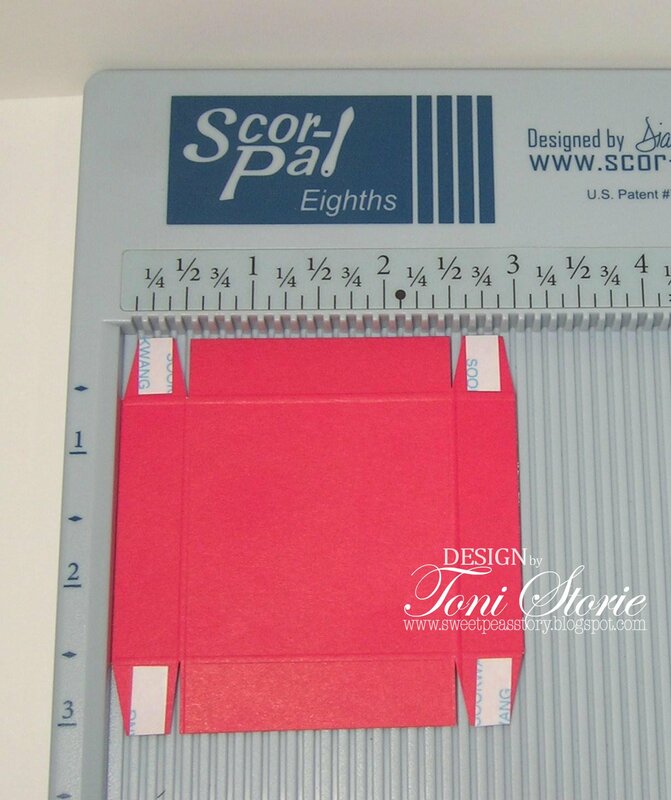 Place 4 1/4" x 5 1/2" card base into the Scor-Pal. 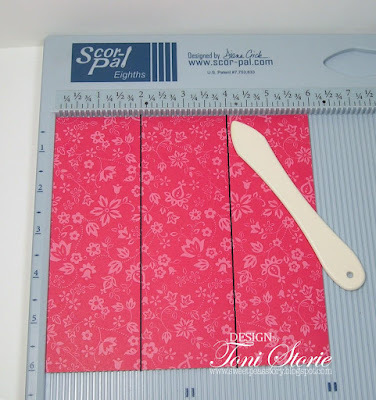 With a craft knife and ruler, trim out a 2" by 2" section. Cut down 2" from 2 1/2" and 4 1/2". Cut from 2 1/2" to 4 1/2" on the 2" mark. 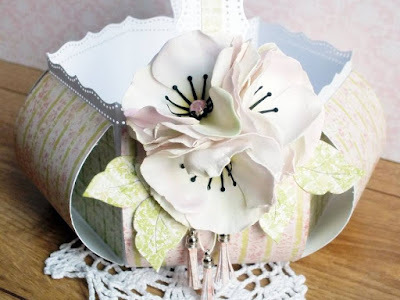 Embellish your gift box as desired and place into the card stand. 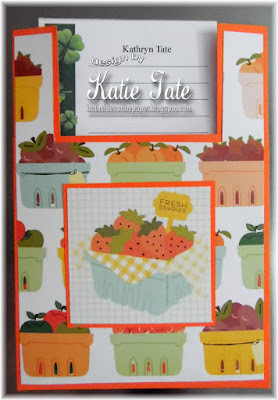 Give this tutorial a try or pick another project. If you are low on ideas or are looking for inspiration, be sure to check out the Projects on the Scor-Pal website or our Pinterest board. * I adopted this tutorial here. 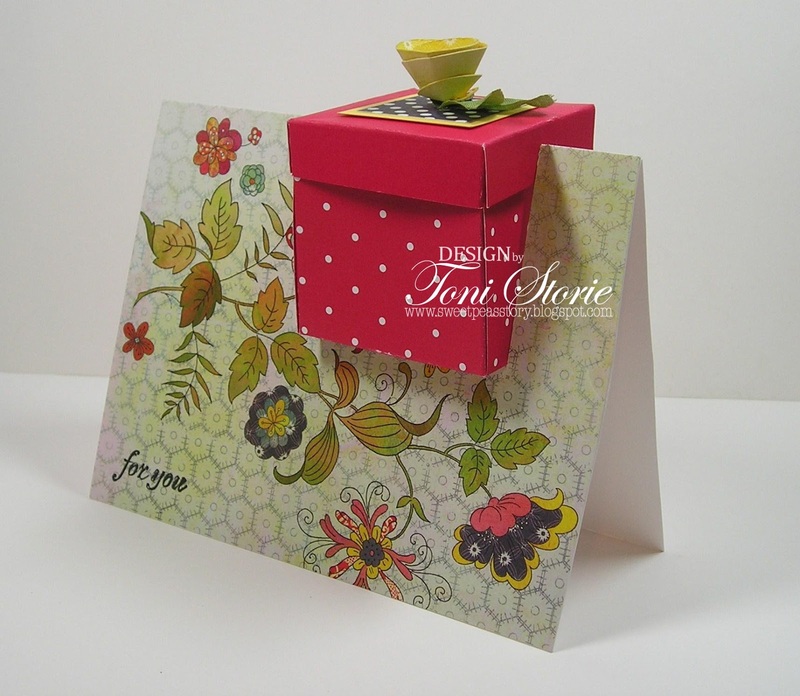 Details - Stamps: Fresh Cuts (SU); Paper: Whisper White, Daffodil Delight, BG June Bug dp, SU Pattern Pack dp; Ink: Tuxedo Black; Accessories: Scor-Pal, Scor-Mat, Scor-Tape, craft knife, ruler, silk flower, glue dots, Recollections rhinestone, crystal effects, Copic Marker, Memory Box small pinwheel posie die. 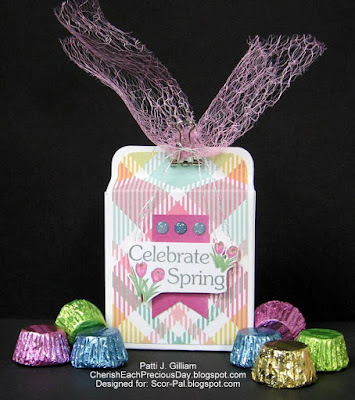 Today we have the name of the random winner from our February Challenge "Anything Goes"
The winner will receive a $20 Gift Certificate to the Scor-Pal Store! So at random the winner is #16 Amy Marshall!! You will receive a $20 Gift Certificate to the Scor-Pal Store! Congratulations and to all our other entrants please enter again, you may be the lucky winner next month! 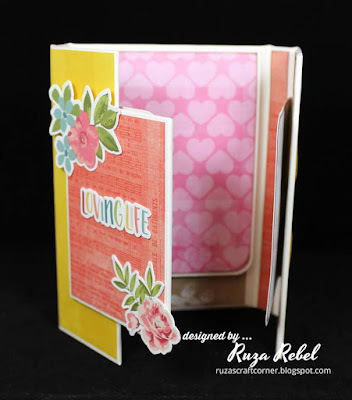 Welcome to the 46th Monthly Challenge here at Scor-Pal! This month our theme is "All Things Bright and Beautiful"